Palestinians Blame Arab Leaders for the "Nakba"
Itamar Marcus and Nan Jacques Zilberdik of Palestinian Media Watch has done great service in collecting at "Arab responsibility for Palestinian refugees" six examples of "Palestinian leaders, writers and refugees [who] have spoken out in the Palestinian media, blaming the Arab leadership for the creation of the Palestinian refugee problem." 2009: "The radio stations of the Arab regimes kept repeating to us: 'Get away from the battle lines. It's a matter of ten days or two weeks at the most, and we'll bring you back." 2008: "The 'Arab Salvation Army' came and told the Palestinians: 'We have come to you in order to liquidate the Zionists and their state. Leave your houses and villages, you will return to them in a few days safely. Leave them so we can fulfill our mission (destroy Israel) in the best way and so you won't be hurt'." 2006: "The leaders and the elites promised us at the beginning of the 'Nakba' in 1948 that the duration of the exile would not be long, and that it would not last more than a few days or months, and afterwards the refugees would return to their homes." 2006: The Arab leaders announced that "The Jews attacked our region and it is better to evacuate the village and return after the battle is over." 2001: A letter from a Palestinian to the leaders gathered at an Arab summit in 2001: "The armies of your predecessors in the year of 1948, … forced us to leave [Israel] on the pretext of clearing the battlefields of civilians." 1999: "Our District Officer issued an order that whoever stays in Palestine and in Majdel [near Ashkelon in southern Israel] is a traitor." Comments: (1) After so many decades, it must be exhilarating to tell the truth. (2) These are hardly the first such statements by Palestinians and Arabs but they are the most recent. For a few of the older ones, note the five collected by Joseph Farah a year ago at "Arab leaders caused refugee problem"
1963: On May 15, 1948, "the mufti of Jerusalem appealed to the Arabs of Palestine to leave the country, because the Arab armies were about to enter and fight in their stead." 1953: "By spreading rumors of Jewish atrocities, killings of women and children etc., [our leaders] instilled fear and terror in the hearts of the Arabs in Palestine, until they fled leaving their homes and properties to the enemy." 1951: "Who brought the Palestinians to Lebanon as refugees …? The Arab states, and Lebanon amongst them, did it." 1949: "The Arab states … encouraged the Palestine Arabs to leave their homes temporarily in order to be out of the way of the Arab invasion armies." 1948: "The fact that there are these refugees is the direct consequence of the act of the Arab states in opposing partition and the Jewish state." 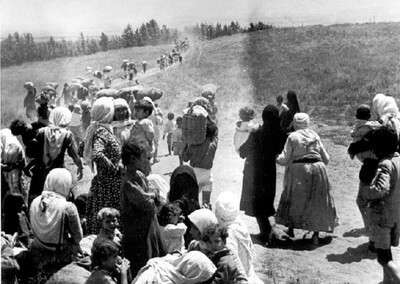 A photograph said to show Palestinians leaving Israel during the 1948-49 war.